From cookbooks in bookstore windows to magazine covers you pass in the grocery store check outline, it is hard not to notice the overhead camera view's popularity in food photography. 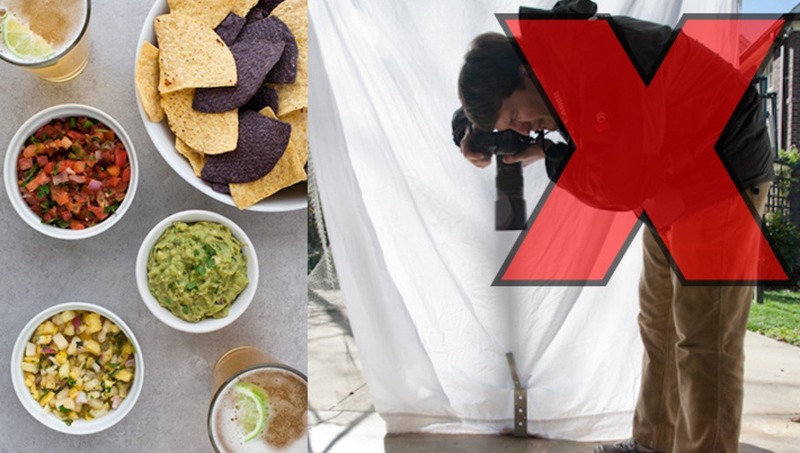 If you are going to shoot your food overhead, there is one piece of equipment that will make your job a lot easier: The Tripod Arm. The overhead camera angle (aka Bird's Eye View) is the go-to camera position when you have multiple dishes that all need to be in focus in the same shot. 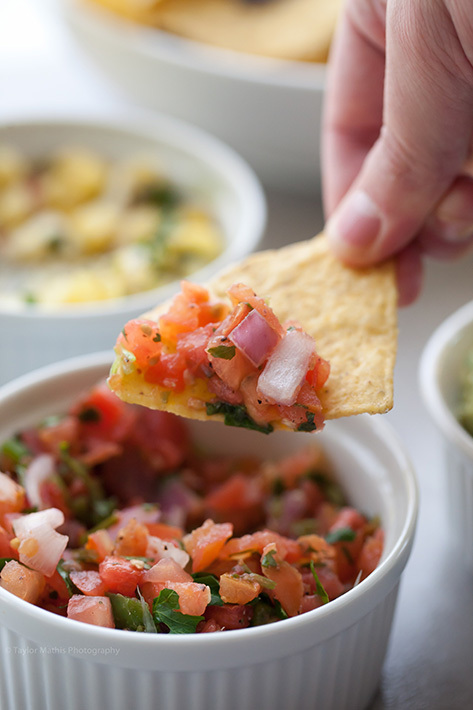 Imagine you are shooting for a magazine or a chef's cookbook and they want to do a story about chips and salsa. 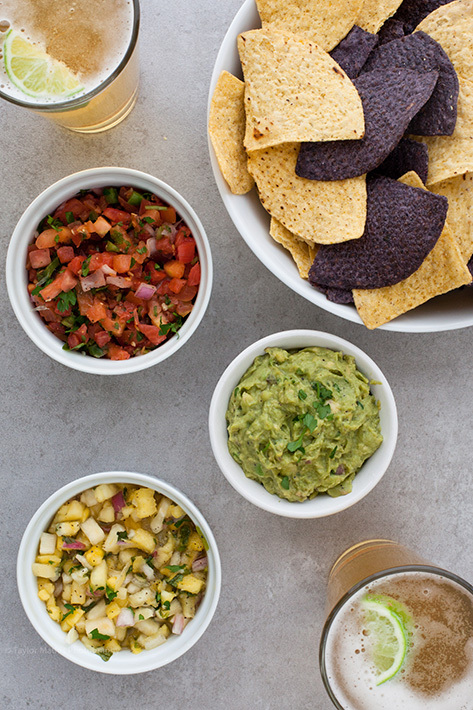 This would be a great shot if you were doing a recipe or story for only one salsa, but for this story, your client wants three recipes pictured. 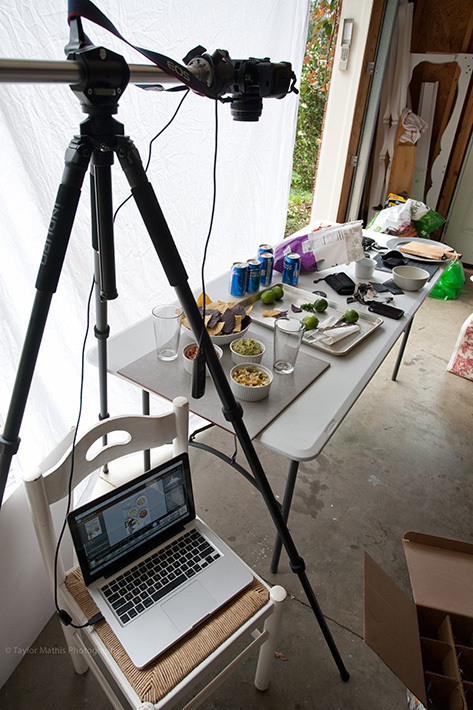 Clients wanting multiple recipes in one shot are not uncommon. 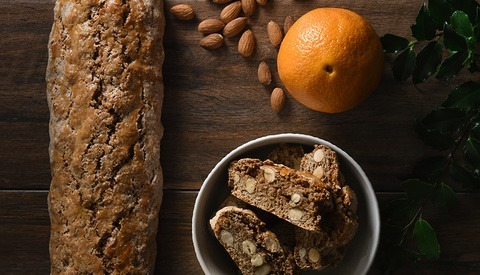 With cookbooks, there are almost always more recipes in the book than images of those recipes, so combining three recipes in one image is something that publishers like to see. To fit three recipes in one shot, an overhead angle like this is more effective. In the above image, you can clearly see the three recipes. If your client is a magazine, a horizontal version of an overhead shot like this would work well for a two page spread. When shooting overhead shots with multiple subjects, there is great deal of moving the subjects around and styling the "hero" versions of the subject. Here are a few behind the scene shots of what went into arriving at the final 3 salsa shot. To shoot from the overhead camera angle, your camera will need to be directly above your set and pointed straight down. If you are hand holding, you will end up in a position like this. This is not a good habit to get into. If you are in a pinch and need to grab a quick overhead shot then you can, but for extended periods of time, shooting in this position will lead to lower back pain and increase the possibility of pulling a muscle and being sidelined for an extended period of time. 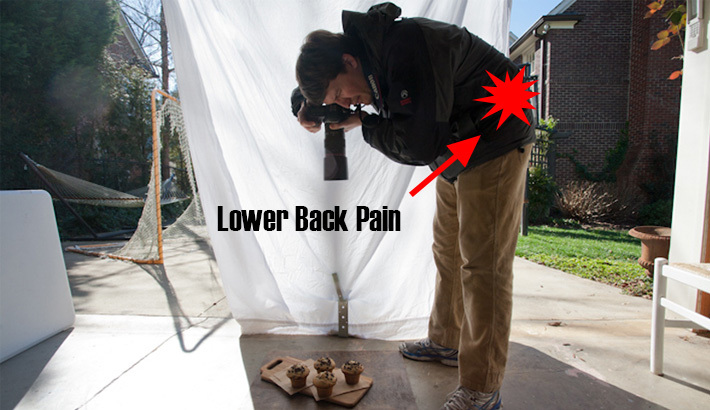 For a freelance photographer, that can be a costly injury. It is hard to pay the bills when you are sidelined on the couch with a back injury. Don't fear, the The Tripod Arm is here to save your back. This metal bar screws to the top of your tripod. On one end you attach your tripod head and extend the bar over the set. Position your camera so it is looking down onto your set. In this image, I am using the Manfrotto 131D Side Arm. With your camera attached to the arm, your camera will stay in one position keeping the same view of your set. 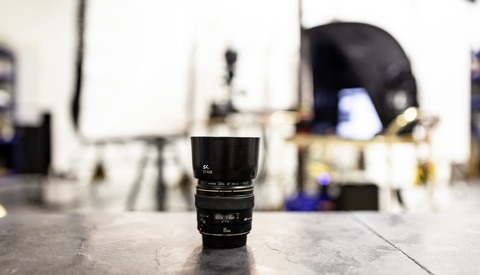 This allows you to not only save you back, but adjust subjects on the set and keep that same camera position. When hand holding and leaning over, you will not always have that same camera position every time. When shooting with a tripod arm, make sure that you are using a stable tripod that can handle the weight of the camera, bar, and tripod head. If you have a heavy lens, camera, and tripod head you may need to add a counter weight on the other end of the bar. Make sure your camera is securely in place and won't tip over before you start working. 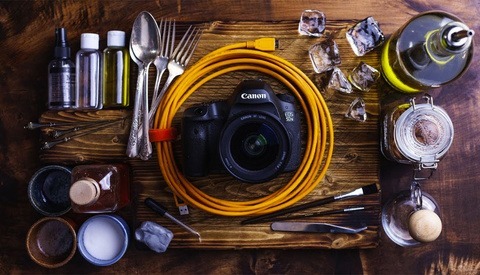 To see what your images look like, shooting with a bar will require you to shoot tethered. I like using a remote when shooting so I don't have to be by the computer the whole time. If you are having back pain or plan on shooting overhead images, give a tripod arm a try. Great post. More proof that you don't need expensive gear to have amazing results. you only get lower back pain when you don't know how to move. No matter what you do, you should always have a stable mid line... and a rounded back is never good. less parts to buy, less disassemble/reassemble to do. Some Tripods have feature built in...although I have met a few that didn't know their tripods did this. I currently use the Manfrotto 190XPROB that supports this feature. I have the 190xPROB and I love it. I get to pull off great stuff like that and it even works well as low clearance tripod with the 90 degree angle. Awesome product from Manfrotto. My Canon 60D with the articulating screen in conjunction with the Manfrotto 190XPROB makes a nice combination for overhead shots. I like to pack light, and leave the laptop at home when I go to a restaurant.. I have the Carbon fibre 190CXPRO3, coupled with a joy stick head, which has the same feature, totally brilliant for travel to since it's so lightweight. I hope he ate that afterwards. It looked good. Hello! Can you confirm what is the tripod you are using. it seems to be a tall tripod, perfect for overhead shots. I was looking at the Velbron V-4 but, for the price, I found it more sensible to buy the Vanguard ALTA PRO 263AT. Just want to point out to readers that many of the less expensive tripods that come with this feature won't be tall enough when you use this feature as you have to remove the pole. Early on I also bought an Alta Pro, like some of you, but I found could only use it if I put the food on the ground. It was also not that sturdy, which was a real problem at the low shutter speeds needed for natural-light photos. I ended up buying the tallest sturdiest tripod I could find used and added an arm. Much better. I have a good travel tripod for when I'm on the road, so I didn't need to worry about it being too heavy and bulky. i have one question. I have BENRO T-600EX tripod and i have upcoming project for head shots. Is it possible to attach Manfrotto 131D Side Arm to my tripod? Or any recommendations for my tripod? Hey, what lens did you use for this shoot? Im doing basically the exact same thing in my project. Any other lens tips I would really appreciate!